It was our genuine pleasure to be invited to broadcast Steve Roach’s “Immerse Deeper” concert from Los Angeles this week on At Water’s Edge. Heard on both Stillstream radio and on a special UStream channel opened just for the occasion, it was the last of three sessions over two days, and was a stunning experience. We were pleased to be able to bring you the result of that last session here on At Water’s Edge, and you can also hear our “Podcast Special” interview with Steve Roach here. For now, we have taken down the recording of the podcast because–big news!–it’s currently in production for release early 2014. Watch this space for more updates! 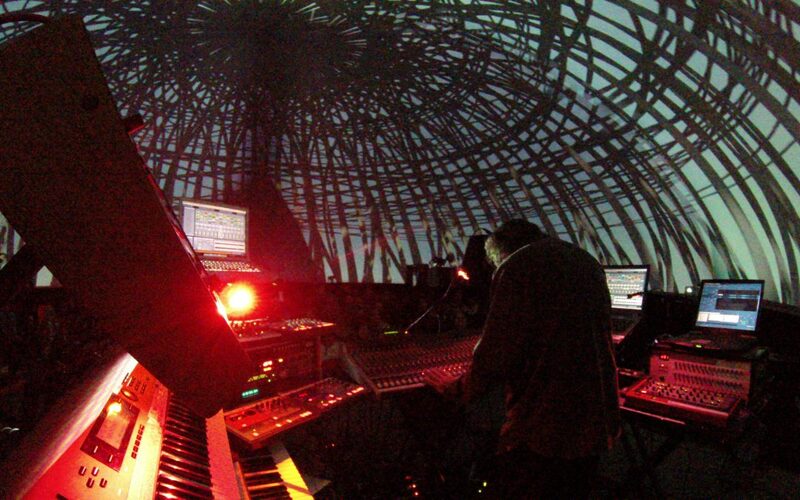 Check the Vortex Immersion Dome web site for more great images of the event! And here are a few from Steve Roach’s console. There were GoPro cameras positioned around his rig, taking pictures every thirty seconds.